If there’s one food I could eat every day for weeks without tiring if it, it’s tacos. That’s partly because there are SO many different ways to prepare them, and I’d never get bored. 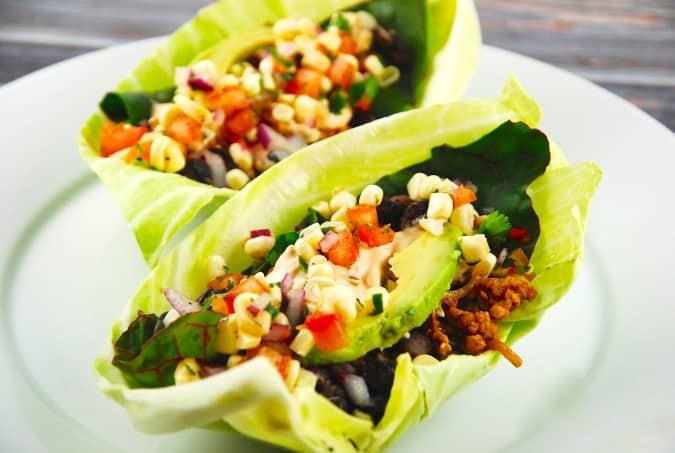 For this chicken tacos recipe, I used cabbage leaves instead of traditional taco shells to help cut carbs and calories. I also added some swiss chard leaves for added nutrition and for its aesthetics. The fresh, raw corn salsa is such a unique flavor too…which I adored. My husband said he would have preferred that the corn was roasted first, so if raw corn isn’t for you, just roast the cob in the oven or on the grill first. But the real show pony of this recipe is the chipotle sour cream!! I could NOT get enough of it! These tacos were a total hit…my 6-year-old devoured them….even with that cabbage shell. And at just 5 Smart Points per taco, you are getting one seriously delicious and nutritious dish! Cut the carbs but keep the flavor with these decadent chicken tacos. The chipotle cream sauce is the perfect compliment to the raw corn salsa and spiced ground chicken breast. In a medium sized bowl, combine the corn kernels, onion, salt, pepper and juice from 1 lime. Toss to combine. Let this sit for a while, about 15 minutes, stirring here and there. Stir in the tomatoes and cilantro, then check the taste for seasoning, adjust as needed and set aside. In a small bowl, stir together sour cream and chipotles and set aside. Heat olive oil in a large, nonstick skillet over medium high heat. Add in ground chicken, and cook, while breaking up with a wooden spoon, until meat is no longer pink. Add in garlic and cook for another minute or two. Then stir in cumin, chili powder, paprika, onion powder, salt, pepper, and juice of 1 lime. Cook for another minute or two, then remove from heat. Assemble tacos by placing 1 swiss chard leaf inside 1 cabbage leaf. Add taco meat, about 2 tbsp of corn salsa, 1 tbsp chipotle cream sauce, and a couple slices of avocado.